Are you a fan of facial mists? I sure am! For the longest time I thought that facial mists just were not a necessary part of a facial skincare routine. Well, at least I thought that until I stared using them! Boy was I wrong. My skincare routine absolutely does not seem complete unless I mist my face with some sort of hydrating toner or facial mist right after washing. I need that instant hydrating boost! 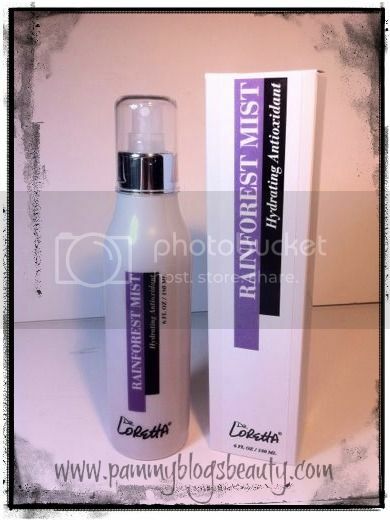 So, as you can imagine, I was very excited to try out this new Rain Forest Mist from Dr. Loretta! This is my first time trying any Dr. Loretta skincare. Dr. Loretta is a cosmetic dermatologist with a background in UVA research. Dr. Loretta's goal with her skincare line is for her products to make your skin look and feel fresher. In a nutshell, I have combo skin that is quite sensitive. My skin is really all over the map lately. In summer it was combo-oily (in the t-zone). Now that we have ventured into cold Fall weather, my skin is getting dry. I am in my late 30s. So, anti-aging products are a must for me! I do not have any wrinkles yet. However, when my skin gets dehydrated, fine lines crop up around my eye area. Generally my skin is clear but I do get the occasional breakout on my chin. Rain Forest Mist: An Antioxidant Facial Mist! Dr. Loretta's Rain forest Mist is a hydrating antioxidant mist that hydrates and refreshes your skin while smoothing your skin's texture. While I love my usual facial mists, I do often feel that their main function is to hydrate. So, I am thrilled to switch to a facial mist that also has the added benefit of antioxidants! To find out more about Dr. Loretta's Rain Forest Mist and my results, please keep reading! The mist is lightly scented with chocolate. OMFlippinG, to say that this product smells amazing is the understatement of the year. Seriously...YUM! What a unique scent for a product. I love it! You know I have always heard about the benefits of aromatherapy. Well, this scent just makes me happy! :) It smells of chocolate and something else that I just can't quite place? It is super yummy either way! This product can also be used on your body as well as your face. Apparently one of the ingredients is beneficial in minimizing cellulite! Cool! Personally, I like to just use it on my face as I am testing out a lot of body products right now. However, I am quite intrigued about its use for the body. Antioxidants and peptides to help reverse visible signs of skin aging. Essential Fatty Acids, including Omega-6 and Omega-9, Vitamins A, C and E, and Resveratrol to hydrate and nourish the skin. Essential amino and fatty acids help regenerate skin cells. Beneficial extracts from the cocoa bean including caffeine which tones skin tissues and helps slow down the effects of distending skin as well as smoothing appearance of cellulite. Cocoa polyphenols that help capture the free radicals responsible for the skin’s aging process. When I use it to refresh, I just spray it into the air and then "walk through" the mist so that it lands on my face. It works great! The mist is incredibly fine. So, you could also mist it directly onto your face. When I use after cleansing (as a toner), I just pat dry my face after washing and then mist about 3-4 pumps worth onto my hand. Then I pat the product on my face. Again, I could just spray directly but somehow I got into the routine of applying my toners with this mist and pat on method. 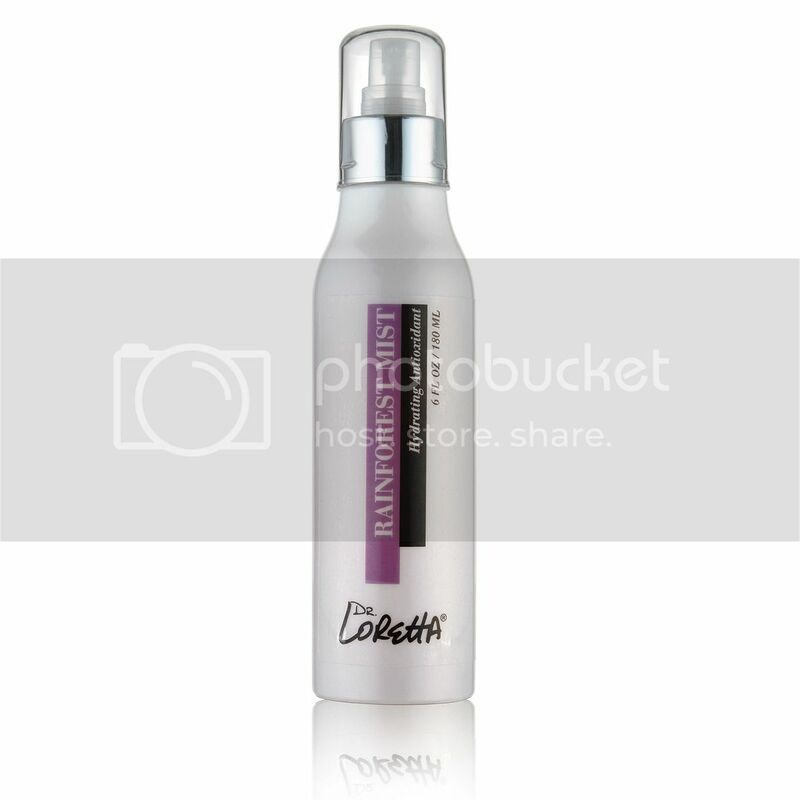 This Dr. Loretta Rain Forest Mist certainly boosts my skin's hydration. Sometimes it takes me a few minutes after washing my face to get my facial moisturizer on. A quick misting and patting of this antioxidant spray gives your skin instant hydration and antioxidant protection. The mist leaves my skin feeling soothed and comfortable. This is one of those products in which the effects are subtle. However, when I skip using it, I miss it. Not only is it a pleasure to use because it smells and feels good but also it really does perk up my skin and makes it feel a bit softer and smoother. Plus, you have the added benefits of the antioxidant age prevention! This product has completely replaced my previous toner/facial mist! I am so happy with this product that I would love to explore more products in the Dr. Loretta line. I highly recommend this Dr. Loretta Rain Forest Facial Mist to anyone who wants to give their skin a little boost of hydration and antioxidant protection! Any other facial mist/toner fans out there?